Have you ever tried apple wine? I don’t know much about wine. I know if it’s red or white and I know if I like it or not. But that’s about it. So I can’t tell you much about how this apple wine tastes, except that I really liked it and it was gone before we knew it. 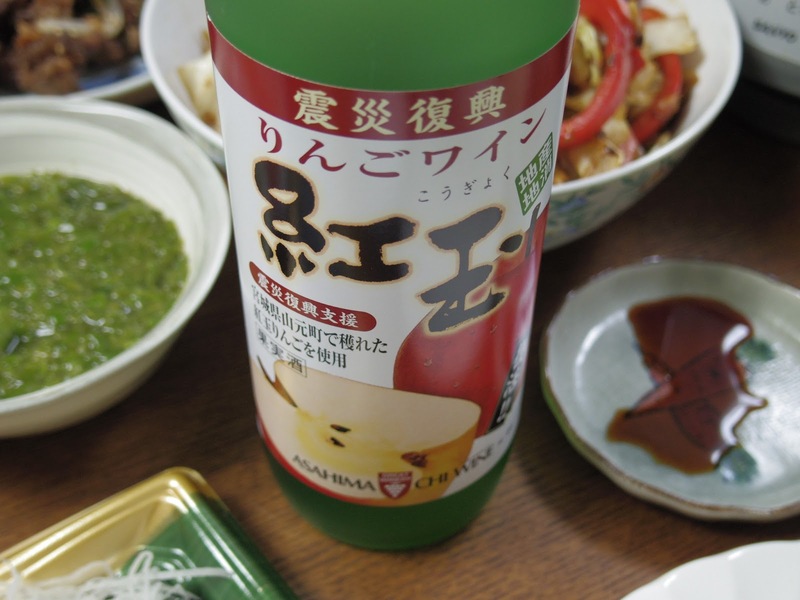 This wine uses Kogyoku apples produced in Yamamoto. They first started selling this wine in 2010 in order to promote the delicious Yamamoto apples. They made the wine at Kikyo Chobei (桔梗長兵衛店), which became a winery in 1910 and was the only winery in Miyagi Prefecture. But in 2011, when the earthquake and tsunami came, the winery was damaged and all the machinery were swept away. Even more devastating was that they also lost the owner and his wife in the tsunami. It was impossible to produce the apple wine in 2011, but through much thought and cooperation with various people after the tsunami, the apple wine was once again produced in 2012, this time to support the efforts of apple farmers trying to get back on their feet. In order to keep things close to home, they found a winery in the neighboring prefecture of Yamagata to produce the wine. And this year, once again, they produced a total of 1,500 bottles this year to be sold in Miyagi. We were there a couple of days after the apple wine hit the shelves and they were already all sold out. It seems there are many fans of this apple wine. Luckily, our friend had a bottle and were all had a chance to taste it. So fruity and delicious. I’m going to have to keep my eyes out for this apple wine next year! Will be on the look out for next year's batch! there is a project to tebuilt the winary!